SEASOFT's Ti STEALTH™ 6 mm Booties, the best booties money can buy. To quote the comparison shown below "This boot (the SEASOFT Ti STEALTH) does everything right." We think you will agree. "The Seasoft Stealth is one of the more rugged boots in a group of rugged contenders. This boot does everything right. Climb into a pair of Stealths and you can confidently carry your gear up and down stairs or over rocks. The arch support provides stability and supports the foot and ankle. An elevated heel contributes to comfort and eases foot strain on those long hikes to the water’s edge under a heavy load. The beefy outsole virtually eliminates flex and compression, and when fitted inside a fin it minimizes the up and down motion of the foot while kicking. According to Seasoft, this design was also intended to eliminate foot cramping while diving. So confident is the company that they actually offer a money-back guarantee—if you get cramps, they will either send you another pair to try, or you can return the boots for a refund. The Stealth comes with lots of rubber armor protecting the neoprene on the top of the foot. The heel cap is also well armored, and it includes a fin strap keeper. The uppers reach six inches above the sole. The zipper has an efficient zipper lock. A gusset behind the zipper helps block water." “I am a combat Strike Eagle pilot of 34 years...They started stuffing pairs of SEASOFT Ti STEALTH Booties in the survival vest I trained with...we had a 17 day long ordeal in a nasty saltwater marsh environment of run, hide and wait for an extraction. SEASOFT's Ti STEALTH Booties are the state of the art in not only dive booties but water sport footwear including jet skiiing, boating, dockwear and other situations requiring good athletic footwear around water. 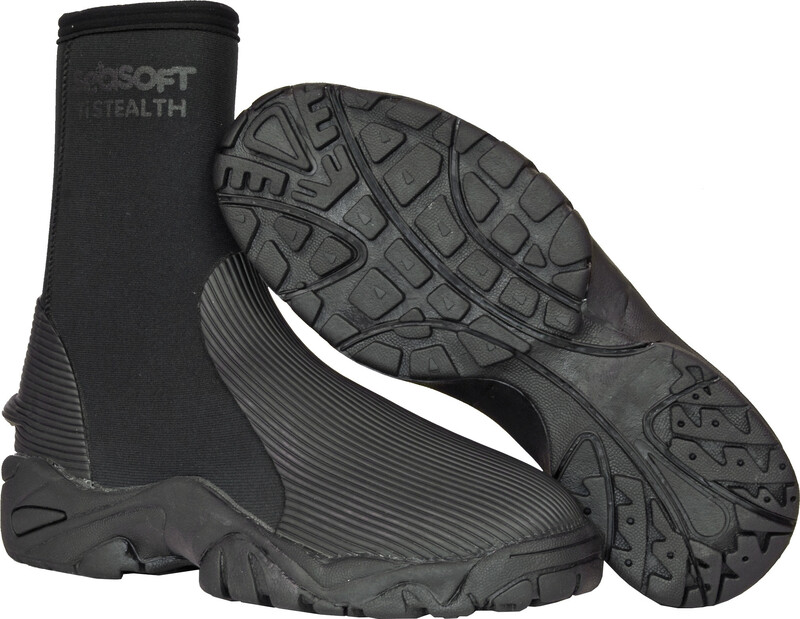 Why should you buy these SEASOFT STEALTH 6 mm Booties? SEASOFT’s STEALTH™ and SUNRAY™ Booties are considered by the US military, professional and recreational divers to be the very best. NO OTHER DIVE EQUIPMENT MANUFACTURER makes an athletic boot! SEASOFT is the only company that creates a full athletic bootie with an elevated heel and orthotics. NOBODY! The rest of the boots sold today are basically bedroom slippers. Cramps are an issue for most divers. Soft-soled dive booties cause the foot to flex continuously inside the foot pocket of their fins causing cramps. Most divers think this is an inevitable price to pay to dive or snorkel, it’s not! SEASOFT uses a hard sole when manufacturing their boots. This eliminates the up and down motion of the foot inside the foot pocket of your fins that causes cramping. By bypassing these small muscles, SEASOFT Booties use the large muscle groups to powerfully move you through the water. SEASOFT Booties have a money back guarantee - if you get cramps, we will send you another pair or you can return them. We have never had a diver return a pair! Another good reason to buy a SEASOFT bootie. Divers can easily carry over a hundred pounds of gear; should you be wearing bedroom slippers OR athletic footwear? The obvious answer, of course, is athletic footwear because an elevated heel and an arch support underneath the sole of your boot create stability and comfort. The elevated heel gives you the ability to safely carry your gear on sand, rocks and lava, or on wet docks and pitching boat decks. The arch support provides stability and supports the foot and ankle. If you agree that athletic footwear is important, you should be wearing SEASOFT diving booties. Our competitors LOOK athletic from the outside but are not athletic where it counts, on the inside. If the heel is not raised, it's just a bedroom slipper! SEASOFT diving booties utilize high quality neoprene, a fin guard, zip-keeper in both booties and 2 layers of Titanium Flake Foil Technology™ for heat retention in the STEALTH Booties™ and Glideskin™ in the SUNRAY Booties™. So join the US military, police, sheriff and fire departments and tens of thousands of other divers in discovering just how warm, comfortable, safe and effective you can be in SEASOFT Booties. Combat Pilot Testimonial: “I am a combat Strike Eagle pilot of 34 years. In 2005 or so, they started stuffing pairs of SEASOFT STEALTH (boots) in the survival vest I trained with. Unfortunately we had a 17 day long ordeal in a nasty saltwater marsh environment of run, hide and wait for an extraction.